The Constellation was designed in 1939 by Lockheed Aircraft Company as a high speed, transcontinental passenger aircraft for Howard Hughes’ TWA (Trans World Airlines). The first aircraft flew in 1943, but WW11 meant all aircraft production was used by the US Army Air Force for transport purposes. There were a number of variants and a total of 856 were built. One variant was the Super Constellation which first flew in 1951. A total of 579 were built of which QANTAS took 16. TWA did not receive its first passenger Constellation aircraft until 1945. The aircraft was a world beater. It was very fast with a maximum speed of ~600km/h. A pressurised cabin meant it could fly above the weather (~7,500m or ~25,000ft) making it a comfortable aircraft to fly in. First class passengers were at the back of the aircraft (away from the engines) and they could carry ~65 to ~90 passengers. The Connie was very popular with many airlines after WW11 including QANTAS on the famous Kangaroo Route to London as well as pioneering their “Round-the-World” service, the first such trans global service in world airline history. VH-EAG ‘Southern Preservation’ is in fact the militarised version of the Super Constellation or ‘Connie’ as it is affectionately known. It was originally built as a C-121C for the United States Air Force, serial number 54-0157, c/n 4176, and was delivered on 6 October 1955 when it was allocated to the 1608th Military Air Transport Wing based at Charleston, South Carolina. On 25 July 1962 it was transferred to the Mississippi Air National Guard and on 14 February 1967 it moved on to West Virginia Air National Guard, where it served for the next five years. Connie’s last active duty was with the Pennsylvania Air National Guard from mid 1972 until its relegation to storage at Davis Monthan Air Base at Tucson, Arizona in June 1977. In 1990 some Society members were in Tucson collecting Neptune spares and saw this derelict Super Constellation. In a moment of madness the thought occurred that it should be recovered to complete Australia’s aviation history and negotiations commenced for its acquisition. Considered obsolete and of no further use, storage maintenance ceased in 1981 and as a result was designated of scrap value only. In addition most of the engine accessories and instruments had been cannibalised. Failure to re-seal the aircraft after an inspection permitted access to legions of birds to nest and foul the interior over many years. This in turn discouraged the scrap metal merchants from bidding on the aircraft due to the infestation of guano and the subsequent imperfections that it would cause in the smelting of the aluminium. In November 1991, HARS started what was to become a major project when 54-0157 was placed in our care for restoration and delivery to Australia. Relying solely on volunteer labour and aiming at a high standard of restoration and serviceability, the project was to take five years. The restoration work commenced in May 1992 at Pima Air & Space Museum and in September 1994 the Super Constellation took to the air after nearly eighteen years on the ground. Another solid year of work was required to prepare the aircraft for the Pacific crossing and in late 1995 final flight training was undertaken. 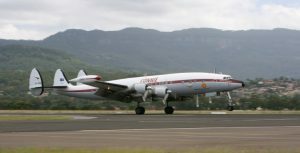 On 3 February 1996 the Super Constellation VH-EAG arrived in Sydney after an incident free crossing of 39.5 hours flying time. Stops on the delivery flight to Australia were made at Oakland, Honolulu, Pago Pago and Nadi. The major difficulty in the restoration process was the need for the volunteers to continually travel to Tucson to carry out the restoration work. This was time consuming and costly even with wonderful support from Qantas. The assistance given by both organisations and the countless individuals in the US and Australia eased the volunteers’ burden and made the restoration process a rewarding experience. Connie is one of only two flying L-1049 Super Constellations in the world. The other is the Breitling Super Constellation in Switzerland. Amazingly both aircraft were built next to each other in the factory. Connie is #4176 and Breitling Constellation is #4177. An L-1649A Super Star (the last model of the Constellation line) is currently in the USA being restored to flight by the Lufthansa Museum. An L-749 Constellation was flown from Arizona to Virginia in early 2016 to be fully restored by Dynamic Aviation. This VC-121A-LO was the original Air Force One used by President Dwight D Eisenhower. She was known as Columbine II. For a history of the HARS Connie and a collection of great images, go to here. Engines: 4 x Wright R3350-93A (3,350 cu in or ~55 L), fuel injected 18-cylinder radial, internal supercharger, 3 x external power recovery turbines, ~ 2,900 to 3,400 bhp depending on fuel. Propeller: Hamilton Standard 43H60. 3blade (aluminium), constant speed, full feathering, reversible.